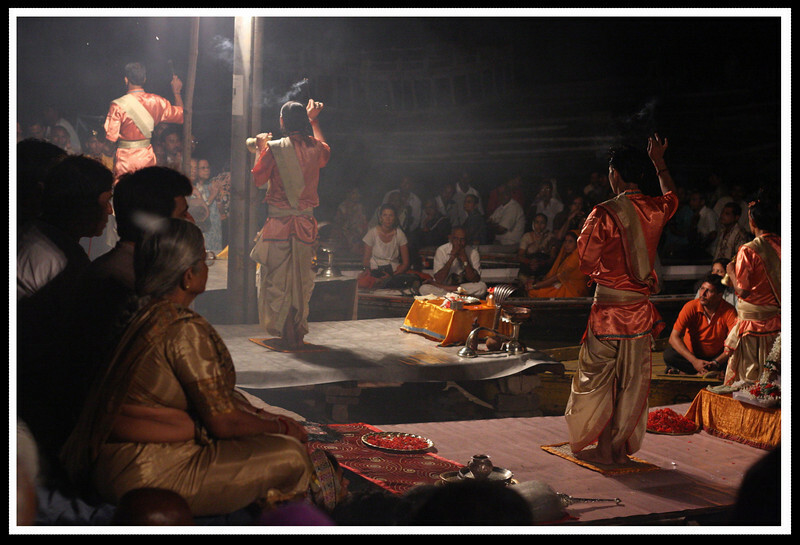 Photos by Ankur of the evening worship at Varanasi (aka Banaras) on the banks of river Ganges. Varanasi, the city popularized in guidebooks for its ‘burning ghats’ has always held a morbid fascination for tourists. According to Hindu belief, dying in Varanasi liberates your soul from the cycle of death and rebirth. Bathing in the water of the Holy River Ganges washes away your sins. The first sight of Banaras on the ghats is enchanting. The city rises out of the river in a crescent shape on its western shore. Ghats are basically steps rising out of the river, leading into the massive network of narrow lanes piled high with a jumble of houses, temples, palaces and ashrams. ‘Ganga arati’, the evening ritual of worshipping the river Ganga is a popular activity, providing entertainment for visitors who happen to visit Varanasi when the ghats are flooded. Young priests, redolent in bright yellow dhotis stand in a row, facing the river, chant mantras to an infernal din of cymbals and other instruments.